If you're looking for some hot new clothes to wear at your next gaming event or convention - well you only need to look up at the swanky folks pictured above. 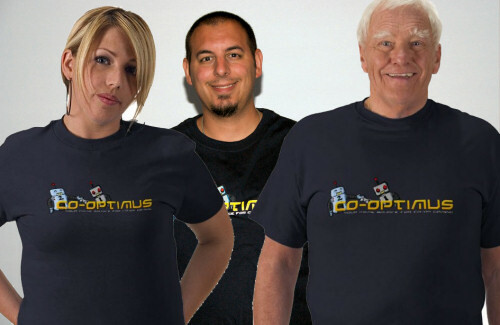 Perfect for gamers of all ages, the Co-Optimus line of clothing is great for any occasion. Not only do we have the great blue logo shirt, but Billy struts his stuff as well, perfect for those family weddings. We've got buttons, keychains and even a little outfit for your baby. Any shirt can be customized to your liking with both color and style.